One of the responsibilities that comes with being a homeowner in the Charlotte area is making important decisions about your window treatments. Your window coverings are a large part of what helps transform your current house into the home of your dreams. There are plenty of options, too, from shades and window blinds to classic plantation shutters in Charlotte. Yet, when faced with the predicament of making decisions about window treatments, many homeowners suddenly feel confused and overwhelmed. This is especially true once they learn just how many different styles of products are available under each type of window covering. There are plenty of options to choose from when it comes to window treatments. Making appropriate choices, for your individual taste and lifestyle, starts with finding the right experts to partner with, in order to get the job taken care of. Homeowners who entrust our team of experts here at Sweet Shutters and Shades tend to quickly realize what makes the experience of working with our Charlotte shutter company so different – we genuinely care about your satisfaction. Shutters were originally installed on the exterior of the home to help safeguard the panes of glass. Since the times and needs have changed, shutters have moved indoors for the most part. However, you do still have the option of interior or exterior shutters, either one could be fully functional or merely décor. This choice of window coverings offer both thermal and sounds insulation. This makes your home both more energy efficient and more enjoyable. The good news is that heightening the energy efficiency of your home will save money on your utility bills and reduce your carbon footprint. 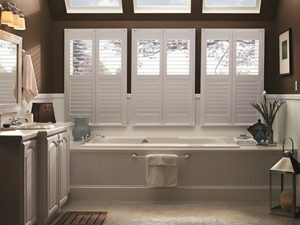 For the maximum in light control and privacy, shutters are the way to go. The system of slats and louvers works well together to give you complete control of the amount of light and privacy you have. This is unlike other window treatment options that can be opened or closed, with very little in between. Window shutters will also help add to the value of your home. Of course, this is only applicable if you choose quality shutters and have them installed by established and reputable industry experts. At the end of the day, ultimately the choice is yours. Our job here at Sweet Shutters and Shades is to provide you with a free in-home consultation so that we can review the information that you need. This also affords us the chance to show you samples, in your very own home. What better way to decide if shutters are right for you home, by seeing them in your home? Contact us now to get started. If you are looking for shutters in Charlotte, NC then please call 704-980-4303 or complete our online request form.